Last week the world lost one of the most brilliant writers of the century. Gabriel García Márquez is considered a genie of modern literature. His words echo the unique and majestic essence of his intrepid spirit. García Márquez will live forever thanks to his master pieces full of imagination and beauty. My Name is Gabito written by the award-winning author Monica Brown and delightfully illustrated by Raúl Colón depicts the childhood of the 1982 Nobel Prize Literature recipient Gabriel García Márquez. Gabito was born on March 6, 1928 in Aracataca, Colombia. Gabito was nurtured by his grandparents along with a 100-year-old parrot named Lorenzo el Magnifico. His grandfather was an important figure for the development of Gabito’s talent. Gabito loved learning words from his grandfather’s dictionary. Gabito realized that the more he read, the more imaginative his stories became. Gabito witnessed the struggles of poor banana workers in his hometown. This situation created an urgent sense of justice and equal opportunity for all people. This life experience was evident in his novels because he often shared stories about the banana workers. Gabito grew, grew, and grew. Gabito became one of the most famous Latin-American writers in the world. As a result, Gabriel García Márquez became an international figure. Gabito wrote more than thirty books, some of his emblematic novels are Love in the Time of Cholera, Living to Tell the Tale, and the best-seller One Hundred Years of Solitude. During his lifetime, Gabito received the most prestigious awards for his merit. In 1982 he won the Nobel Prize for Literature reaffirming the remarkable gift to produce incomparable stories. Gabito married his boyhood girlfriend, Mercedes Bacha Pardo, and they had two sons named Rodrigo and Gonzalo. This is a phenomenal life for an incredible human being. My Name is Gabito helps children learn and appreciate the extraordinary journey of Gabriel García Márquez, and it also allows them to discover the dynamism of the renowned author. His legacy will last for an eternity in our hearts and in our mind. 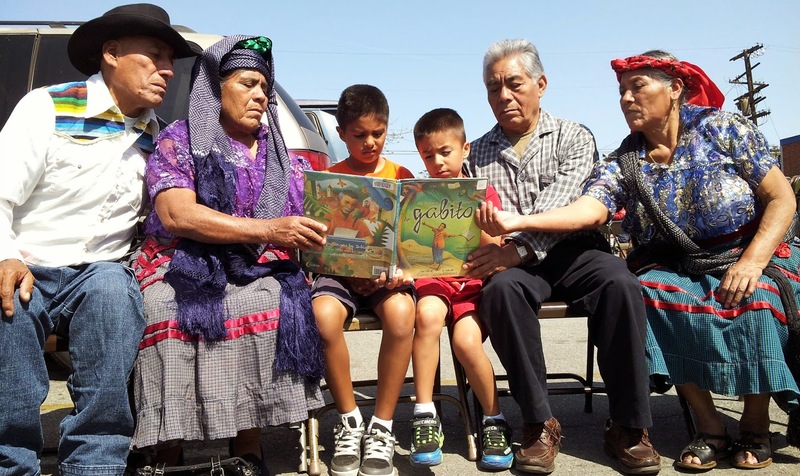 Thanks to the Tlapazola community from Oaxaca, Mexico for spreading the legacy of the eternal Gabito. ¡Viva Gabriel García Márquez por siempre! Sounds like a wonderful book and inspiration for children. Thanks for sharing. Sounds like a wonderful book to inspire young children.